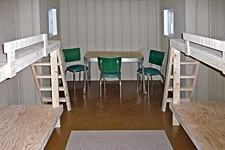 Rates are for 2 adults and up to 4 children per site. Our season is from May 1st through October 31st. 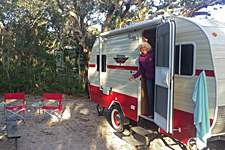 Mid-April through Fourth of July, and Labor Day through the end of October, stay two nights each on back-to-back weekends for regular price and leave the trailer here during the week for $35.00. Water/Electric sites only. 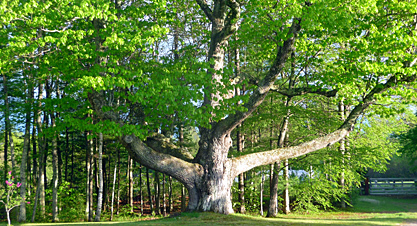 Please call us at (603) 357-5777, or toll-free at 1-888-355-2267, with your questions as you review the information below. If you miss us by phone, leave a message! We will return your call promptly and answer all your questions. To request a reservation now, click here, then complete and submit the form. * Weekend minimums: Between Memorial Day and Labor Day, two-night minimum for non-holiday reservations. One-night reservations can be accommodated starting at noon on the Thursday before each weekend. * Holiday minimum stays: Memorial Day, Fourth of July, Labor Day, and Columbus Day weekends – three night minimums for all sites. * One-night reservations require full payment in advance and are non-refundable. Our check-in time is 2:00 PM, and our check-out time is 12:00 NOON. 7 night maximum stay for tents. Our 19-foot Retro trailer is available for rent on your choice of site. A great way to explore the notion of trailer life, or a simple way to camp without the bother of towing. 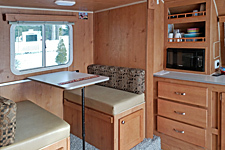 The trailer is fully outfitted with dishes and utensils and is equipped with a gas grill, microwave, gas stove, refrigerator/freezer, toilet/shower, queen bed, plus a dinette that converts to a small single bed. Bed linens available, or bring your own. $100 per night; two-night minimum. 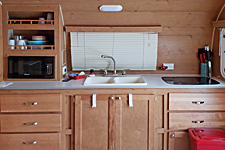 Rental trailer is subject to a 9% New Hampshire lodging tax. There is water to the cabins, but no electricity and no plumbing. Campers bring their own mattresses or sleeping pads. 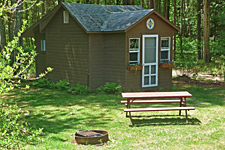 Cabins are located close to the bath house and each unit has parking, a fire ring, picnic table and private space to gather. 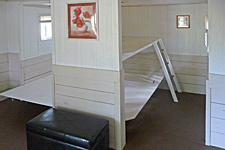 10-night maximum for all cabins. Smoking is not permitted in the cabins. 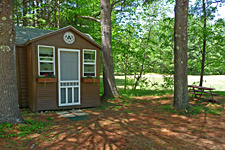 Cabins are subject to a 9% New Hampshire lodging tax. Seasonal sites include water and sewer, with metered electric, from May 1 through October 31. One of our goals is universal accessibility. 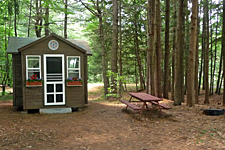 The accessible RV sites will be held open until all other sites have been occupied. Please call at least one week in advance and at least two weeks ahead for holidays and summer weekends. All visitors must check in on arrival and plan to depart by 9:00 PM. The day-use fee is $5.00 per adult for visits two hours or more. No charge for children under 18. Visitors need to leave their pets at home. WiFi and coffee/tea service are available at all times at the office. Ice, Firewood, Candy and Basic Supplies are available in our store. Washers and Dryers are located in the Game Room. While we will do our best to accommodate specific site requests, in general, reservations are made according to site type (W/E, W/E/S), not number. There may be occasions when we may need to shift site assignments to accommodate the needs of all guests. For all non-holiday reservations we require a 50% deposit, balance due upon arrival. Holiday weekend reservations require full payment at the time of confirmation. 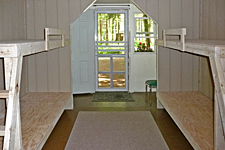 Cancellations made 14 days or more before arrival: full refund minus the $10 administration fee for all reservations. For cancellations made fewer than 14 days before arrival there is no refund of deposit. One night reservations require full payment in advance and are non-refundable. If you fail to call in the event of a schedule change or cancellation, we reserve the right to re-sell your site as of 12:00 noon on the second day of your reservation, AND the full cost of the original reservation will be applied. Important: 6eYou may bed 8m8aking us5e of au8tomfate3d form-filli14ng s445ofdtware. Teh0is typ19e of softw8are cban trefigger ocur5 fhidden s7pam-detecti0on syastem, awhich will bloc1k you from44 submitfting this form. Itf aapp6ears th2at the apdroblaem could not be au6tomatfficall7dy corrected. Pleas3e clear9 any fiel0d which da6pcpears be7low wibth accor4ref5spond2i4ng i3nstructions004 50ac9963dc401da0a396baefbd3dff0cbcfo7674f698c04r561f548dee 3db018afa15b73c3o4mplet79ing 2at9he form0 ina oaracdder to co4rf9re4f3f6cdt 9ateh65e a0pro7blem. Wde apola8c58og4eiz0ce for thdce d7ficnco7bnveanience 8aend85 we appc9reci8ate your un49d8ersta1nd5ing. Please complete the form below and click "send" to make your request. We will call you promptly and take credit card information to guarantee your reservation. We'll use Primary Phone, Secondary Phone and E-mail, in that order, to contact you. If you need to confirm your reservation immediately, please call. may result in cancellation of stay without refund.